Photo by Brandon AlmsDuring the remodel, the team paid close attention to every detail to ensure the office created a comfortable, welcoming feeling for clients. 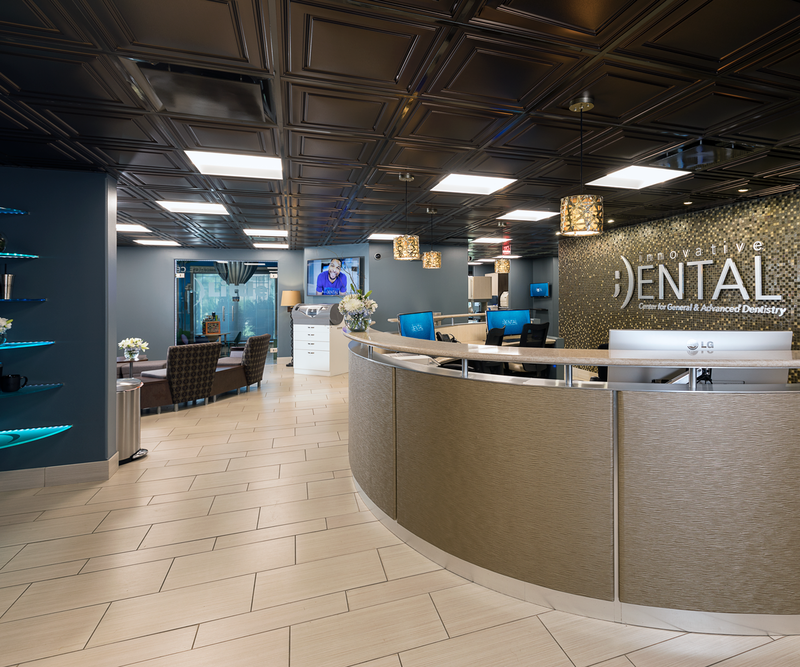 When patients first walk in to the Innovative Dental office, they’re greeted with music and a neutral color palette with pops of blue. When the reminder pops up on our calendars, we all let out an audible groan. Time for your next dentist appointment. 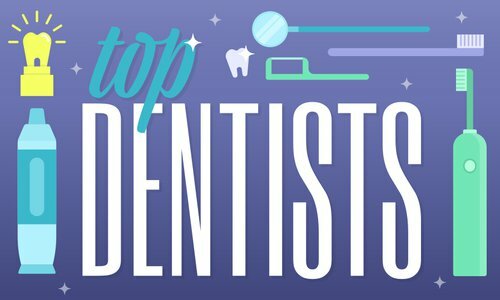 It’s no secret most people have apprehension about going to the dentist’s office. 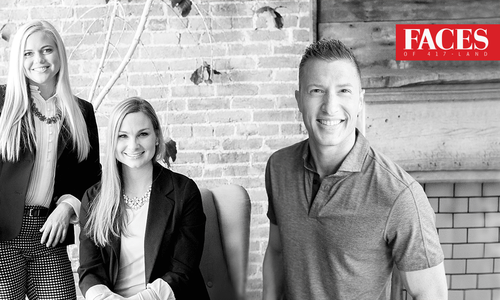 And that’s exactly what the team behind Innovative Dental’s remodel worked so hard to combat. Dr. Grant Olson bought the office in 2013, when it was a dental office on one side and a small event rental space on the other. Several months after purchasing, the patient base began to grow quickly and Dr. Olson added a second dentist, Dr. Megan Westrich. 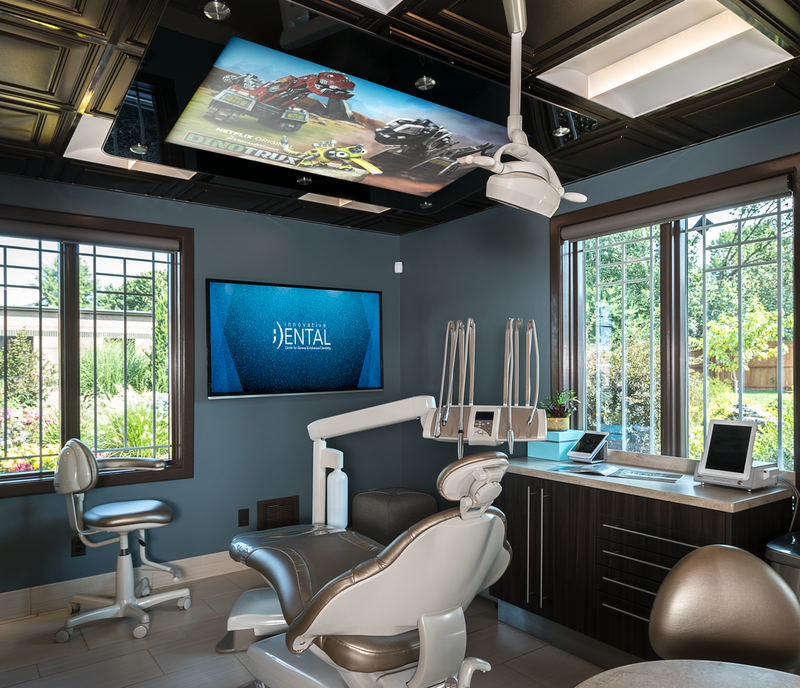 Soon after, plans for the remodel began with the vision to create a dental office in which every detail catered to the people walking in the door. 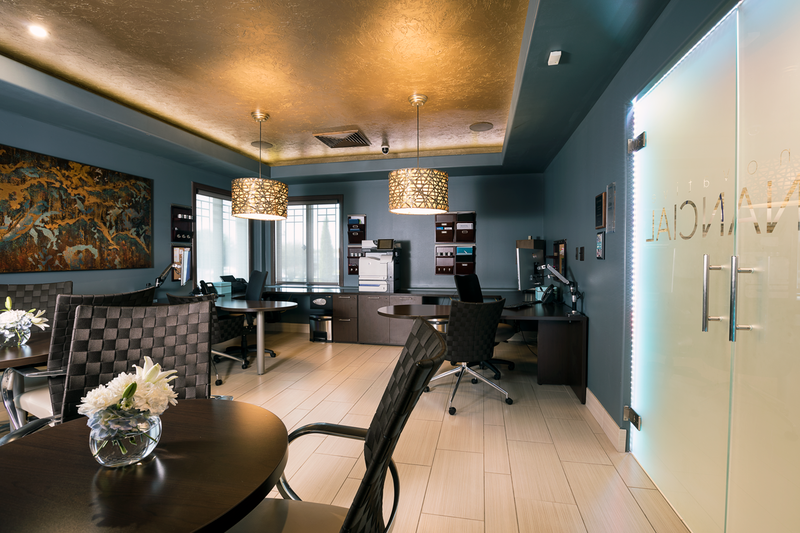 Bruton Design Studios helped carry out Dr. Olson’s vision through careful selection of dental equipment, wallpaper, waiting room furnishings, and decor. The remodel was completed in 2015. 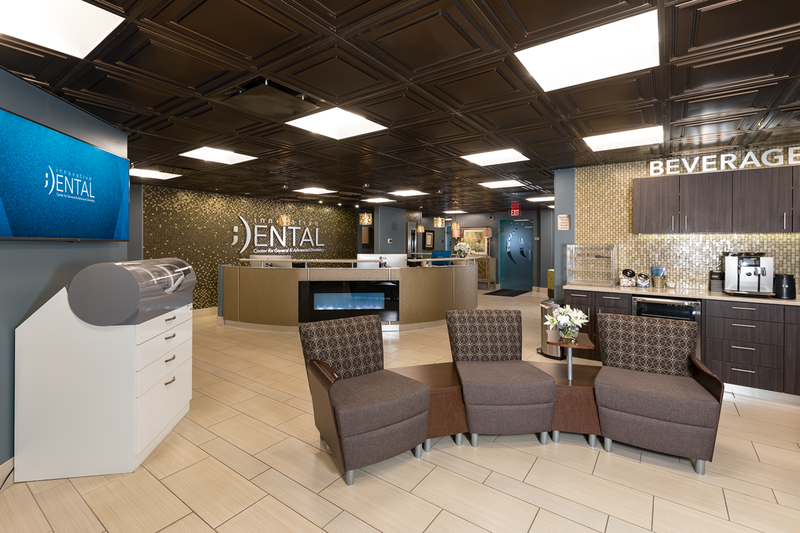 Abigail Feil, Innovative Dental’s Marketing Coordinator, says the inspiration was “to create a dental spa.” Every creature comfort is offered in an effort to alleviate dental anxiety. Beyond a regular waiting room, the spacious office has a Comfort Room with massage chairs and a movie screen and a beverage station with made-to-order frappes. “We want people to feel at home here,” Feil says. Although the office is certainly impressive, Feil says the space was always secondary to the people. 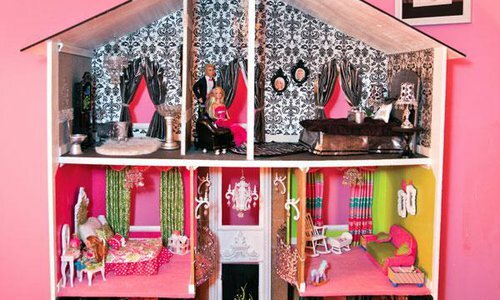 “The remodel was a symptom of everything we wanted to create,” she says. “Our focus was just to be kind and show compassion to our patients.” That compassion is what inspired the design. Another focus was on transparency. There are only three sets of doors in the whole office: to the finance room, insurance room and the Little Innovators room for children. The finance and insurance room doors are frosted, and those are designated private areas for more intimate conversations. 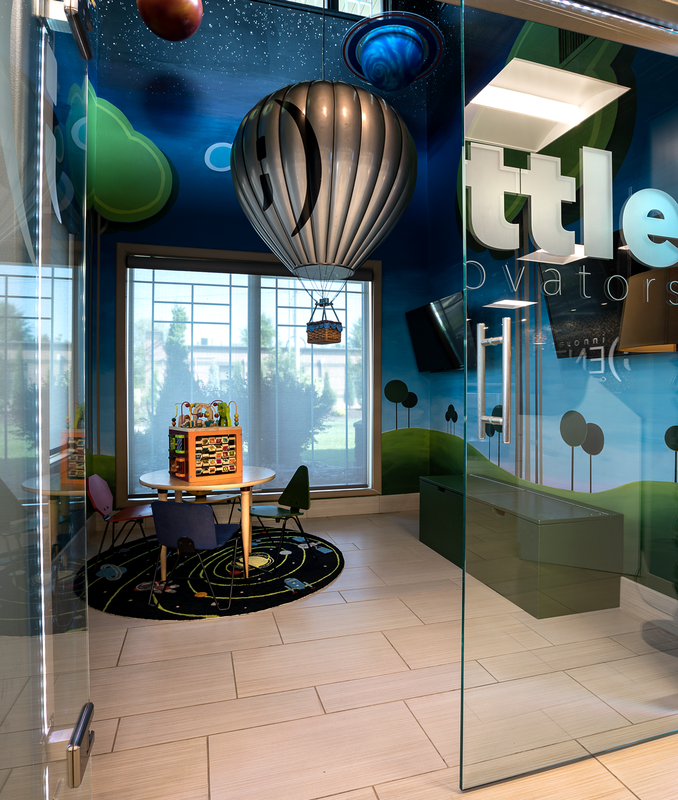 The Little Innovators room is all about the kids, and the doors are clear so parents can keep a watchful eye. The lack of doors on the 10 operating rooms was intentional. “We didn’t want any part of the office or team to feel off limits,” Feil says. With so much to offer, it’s easier to spend time here without anxiety building. Dr. Olson thought of every possible need during a dentist visit, and it makes that calendar reminder less groan-inducing. Photo by Brandon AlmsThis part of the reception area specifically faces the Little Innovators room so parents can keep an eye on their kiddos. The Beverage Center is available for patients to get their own refreshments. The machine to the left is a Sirona Cerec MC XL milling and grinding unit that is one of four the office uses. The machine creates same-day crowns based on 3-D designs, and Abigail Feil says it’s a neat thing to keep in the lobby for people to see. In the background, you'll see a fireplace. 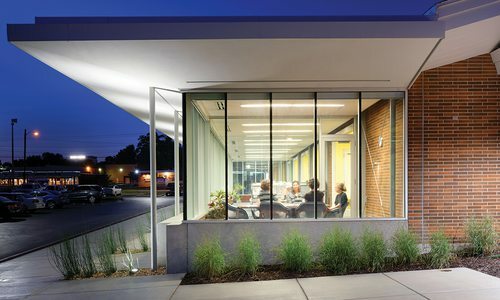 Dr. Olson wanted to create a warm and welcoming environment, while still maintaining a modern feel. While enjoying cookies and coffee in the waiting room, patients view a fireplace blazing within the front desk. Photo by Brandon AlmsThis backyard retreat was designed to be an extension of the indoor waiting area and to provide more space than the Comfort Room. The patio has a pizza oven, a smoker and grills that the staff uses to occasionally host pop-up barbecues. 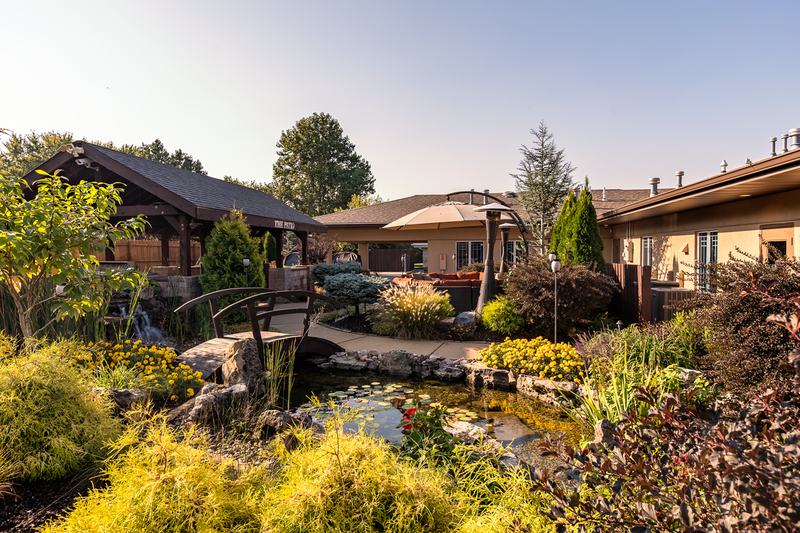 The attention to detail on the inside is replicated in the exterior, with special attention paid to landscaping so patients get a feel for the office and the environment before they even step indoors. Photo by Brandon AlmsPerhaps the most evidence of commitment to patient comfort can be found in the exam rooms. 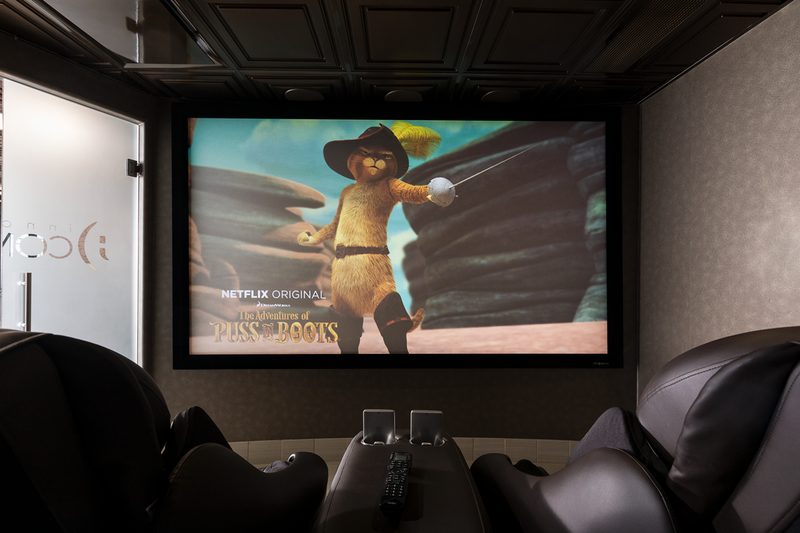 Each is equipped with a 4K TV mounted above chairs that have massage and heat functions. Photo by Brandon AlmsDr. Olson had an imaginative vision for this room dedicated to the practice’s littlest patients. Local artist Christie Snelson created the mural that goes all the way from green grass to outer space in the room’s tall ceiling. Elemoose created the planets and spaceship, as well as an interactive hot air balloon that floats up and down with a motion sensor. Photo by Brandon AlmsThe word “innovative” rings true with the tools the practice uses to create custom health plans for patients. The iTero scanner (left) creates a digital model of teeth and can simulate movement of teeth for potential Invisalign patients. 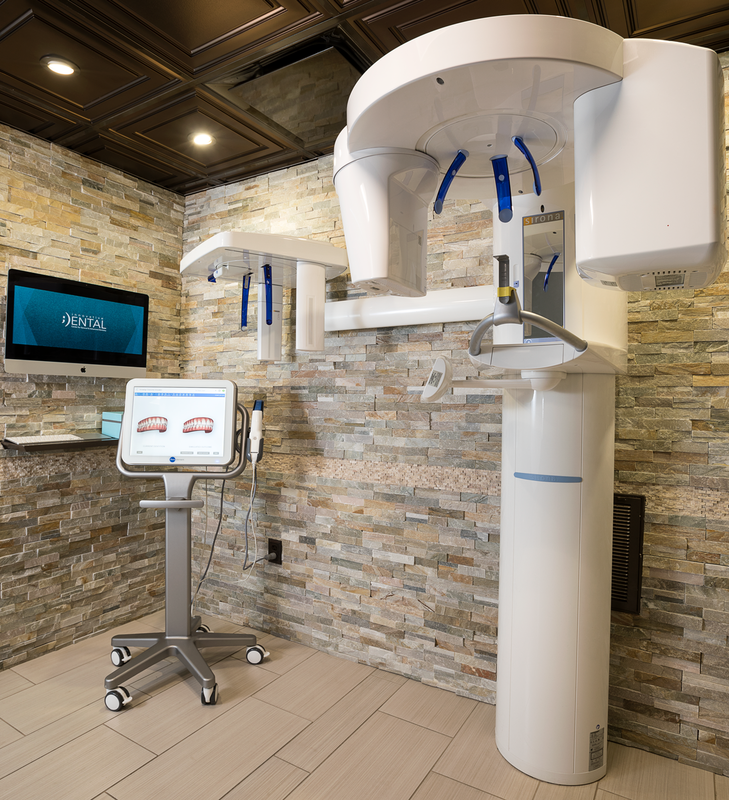 The Sirona 3-D Galileos takes 3-D X-rays that help the doctors look from every angle and plan and place implants in 3-D first for a more precise procedure. Photo by Brandon AlmsAlthough most of the office is open, the financial conference room is one of the few areas with closed doors. This allows patients to feel more secure having private conversations about their medical treatment and finances. The space also acts as a conference room for meetings. Photo by Brandon AlmsThe quiet comfort room is a relaxing spot for patients to go before or after appointments, or when they’re waiting for something to be done in-house, like having a crown made. Two medical-grade full body massage chairs face a screen with Netflix streaming, so you can binge watch while you wait.